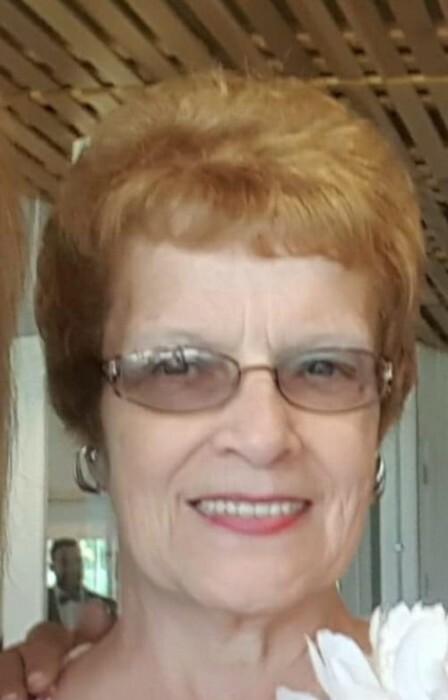 Obituary for Carol Lee Halterman | Goldsboro-Fabry Funeral Home, Inc.
Carol Lee (Organt) Halterman, age 77 of Fairchance, went to be with her Lord and Savior on Wednesday, June 13, 2018 in the Uniontown Hospital with her loving family by her side. She was born on May 16, 1941 in Masontown, a daughter of Marino Organt, Sr. and Sue Haught Organt. In addition to her parents she was preceded in death by her husband, Walter M. “Sonny” Halterman; brother, Mario Organt, Jr.; son-in-law, Randy Lake; brother-in-law, Jim Bolander. Carol was a very active member of The First Presbyterian Church of Fairchance where she served as: Deacon, Elder, Clerk of Session for 25 years, current church secretary sending correspondence to shut ins and ill congregants weekly with an up lifting note, and the choir. She was a master organizer of all aspects and programs of the church. She was active in women’s ministries including Community Alliance of Christian Women and the Community Vacation Bible School. She was instrumental in the successful buckwheat dinners being served at the church twice a year. She was truly an example of a Christ-centered Christian. Carol is survived by her four children: Sandra Lake of Fairchance, Audrey Borytsky and her husband Mark of Bellevue, NE, Patrick Halterman and his wife, Carla of Uniontown, Cynthia Fike and her husband Harry of Uniontown; Eight grandchildren: Craig Foster and his wife Ginger of Lake Royal N.C, Ashley Filmeck and her husband Chad of Uniontown, Mark Borytsky Jr. and his wife Celeste of Bellevue. NE, Michael Sutton of Uniontown, Lee Borytsky and his wife Brandi of Albuquerque, NM, Nicole Halterman of Uniontown, Amanda McClelland and husband Danny of Morgantown WV, and Bradley Borytsky of Rapid City SD; five great grandchildren: Lacy, Matthew, Mason, Evelyn and Elliott. Sister, Louisa Bolander of Cresson City, CA; sister-in-law, Joann Organt of Woodbridge, VA. Mom was such a gem. She always had a smile and offered a helping hand to everyone. You never heard her say anything unkind to or about anyone. Nothing will ever take her place. We are thankful for the amazing woman of God she was and the many many hearts she touched while she was here. What a beautiful legacy she leaves behind. She anxiously awaitsg the day when we will be reunited with her. Carol's family would like to extend a special thank you to Dr. Peracha and his staff for the wonderful care given to Carol. Carol’s family will receive friends from 6-8 pm on Saturday, June 16, 2018 and 2-4 and 6-8 pm on Sunday June 17, 2018 in the Goldsboro-Fabry Funeral Home, Inc., 21 E. Church Street, Fairchance, PA. Additional visitation will take place in the First Presbyterian Church of Fairchance on Monday, June 18, 2018 from 10 – 11 am. Her funeral service will begin at 11 am with Rev. Robert J. Robinson, officiating. Interment will follow in Mt Moriah Cemetery, Smithfield, PA.
Memorial contributions can be made to the First Presbyterian Church, 114 West Church Street, Fairchance, PA 15436.